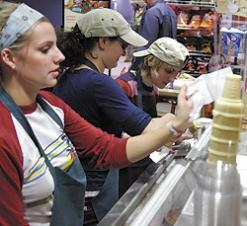 Liesl Eigenberger, Erica Miller and Liz Klainot, employees at Memorial Union, serve ice cream Monday evening. A recent referendum has exposed a potential loophole that has some students worried they will no longer have control over how their segregated fees are distributed, despite having the legal right to decide how they are spent. The referendum, passed by a student vote, changes the Student Services Finance Committee's by-laws to prevent it from approving auxiliary budgets that provide less than $10 an hour for employees. Such budgets help fund UW-Madison services provided by the Wisconsin Unions, University Health Services and Recreational Sports, where employees, including Limited Term Employees, receive less than a 'living wage' of $10 an hour. The referendum, intended to increase wages of LTEs from $7.30 to $10 an hour, passed 1379 votes to 612. "To provide these new wages, our options would be possibly increasing seg fees, increasing prices on certain products and services, or decreasing the amount of services we provide," Wisconsin Union Director Mark Guthier said. The Union Council, which includes nine students, approves the Union's budget every year. This budget is then sent to SSFC for review and then to the chancellor for final approval. "I absolutely think it will help out employees, including limited term workers. These individuals are mothers and fathers trying to support their families," Sarafolean said. "UW students have shown with their votes that they don't want their seg fees to be part of these poverty wages. If the Union wants our funding, they will have to increase their minimum wages." The changes restrict the power of the SSFC so that it will no longer be able to approve all auxiliary budgets. "The change allows budgets without living wages to go from say, the Union, directly to the chancellor, taking student input out of the process in violation of shared governance," said Eric Varney, chair of Associated Students of Madison. However, according to shared governance law, if student segregated fees are to be used, students must be able to review and make recommendations to the budgets that use them. "It's within our rights to say where our money goes-the chancellor needs a recommendation from the SSFC. If he does bypass them, lawsuits may result," ASM Diversity Committee Chair Ryan Sarafolean said. "The shared governance law from 1978 hasn't had that many cases associated with it," SLAC member Ashok Kumar said. "This situation therefore could be precedence-setting."